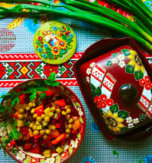 You’ve probably already tried a traditional Ukrainian beetroot salad. However today we are going to cook unusual white vinegret. You can serve it on your festive table. 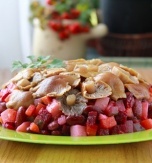 Your guests and relatives will definitely evaluate this extravagant salad. 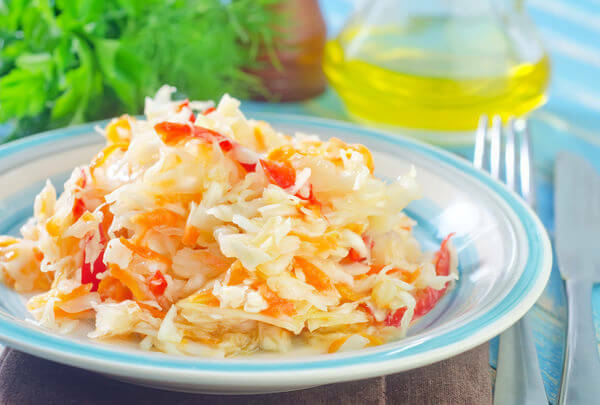 Contrasting flavors make a great base for this vegetable salad – the combination of apple, carrot, sour cabbage, onion, white beans, and potatoes with olive oil and grape vinegar dressing. 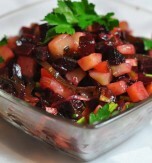 This is a delightfully simple yet so sophisticated and flavorful salad. Boil potatoes and a carrot. Peel and dice the vegetables. Wash and peel an apple. Remove the core. Cube the apple. Peel a bulb onion, scald it and cut the onion finely. Wash and boil white beans until done. Combine the cabbage, onion, potato, carrot, apple, and beans. Adjust salt and pepper to your taste. Stir everything carefully. Mix olive oil and grape vinegar. Combine the salad with the prepared dressing. 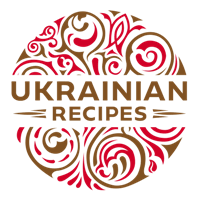 Do you have a favorite recipe of Ukrainian vinegret? If so, please let us know in the comments below or write us an e-mail.